Once believed as the secret for immortality, this native Asian seed has a sweet, spicy, nutty flavor with a hint of bitter orange. Lightly dry roast or toast in oil before using it in Indian and Southeast Asian curries, pickles or snacks. Goes well with lentils, beans, onions, potatoes, coconut milk, vegetables and fish. 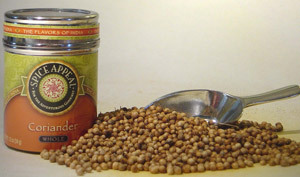 Coriander seeds blend well with smoked meats and game and are featured in traditional English black pudding recipes and Italian mortadella sausage.